I’ve been nagged by many who have been wondering why I’ve decided to just stop. I guess it’s a combo of things. Firstly the lack of time with the crazy work schedule that one has no time to breath anymore. Once that was over, it was the lack of good places to blog about. Nevertheless, despite a week’s break, it has taken me quite some time to “get back into the groove”. As a friend nagged last weekend, I really should just grit my teeth and start doing it. I guess after a long absence, it’s like riding a bicycle, you know you can do it but it scares you a little. This particular street seems to be deluged with the biggest contingent of Teochew porridge stalls in town. If it not a Teochew porridge stall, it’s probably some Sichuan food place. 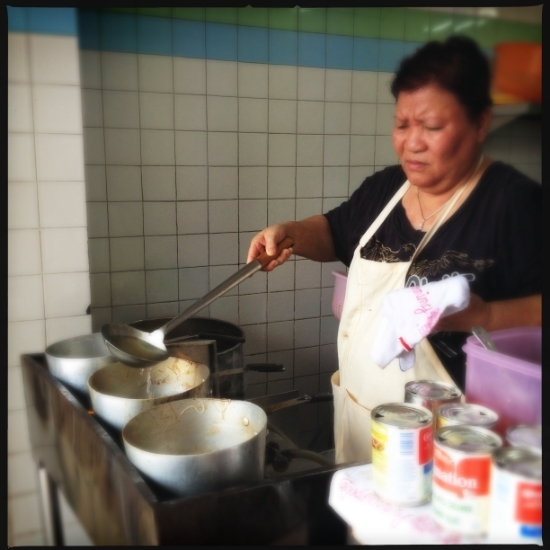 Even the stall is located within a Teochew porridge stall, an old school one that my Mum remembers frequenting a while back. At first I was a little worried about this place since it didn’t have many customers but as the lunch crowd swelled up, more customers started ordering their noodles. Don’t play play, I use Carnation evaporated milk, okay?? But one slurp of the soup in my bowl of noodles confirmed that this place was a hit. 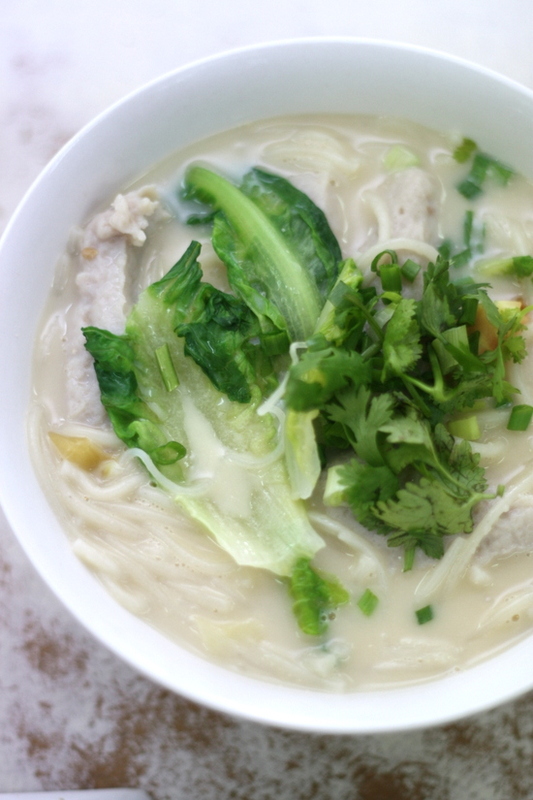 The soup tinged white with a dash of evaporated milk is fragrant with just a hint of Shao Xing wine. Everything is well balanced and there’s no fishy smell. The lady owner adds ginger shreds, quartered tomatoes and sliced preserved cabbage (ham choy) to alleviate the fishy aromas. 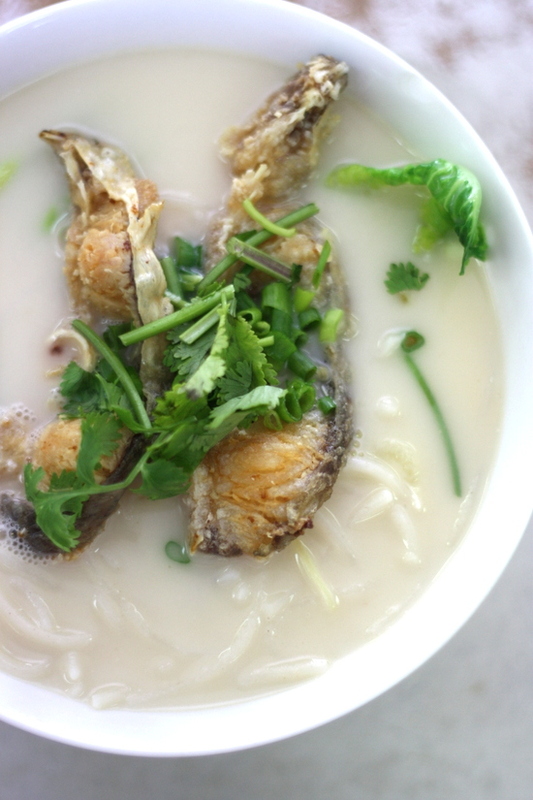 And for those big eaters, you can also order bits and bobs from the Teochew porridge counter. We greedily added a plate of braised pig’s intestines as we waited for our noodles to be cooked. Give it a try the next time you hit Pudu as these noodles with its gorgeous soup is definitely worth a trip here. A small bowl of noodles was about RM7 each for the different variety. No wonder, everyone calls Pudu, the food wonderland since just round the corner is crispy siu yoke at Robert’s and there’s also siphon coffee at Typica.